1 – 4 PM, RSVP before Apr 8, Thur. Born in Shizuoka, Japan, Kazumasa Oda studied interior design and architecture at Parson’s School of Design in New York City from 1967 to 1969 and has worked in interior design firms for more than three decades. His architectural background frees him to render the complex, Beaux-Arts buildings. While traveling throughout Europe and Asia, Kaz started sketching buildings and landscapes. 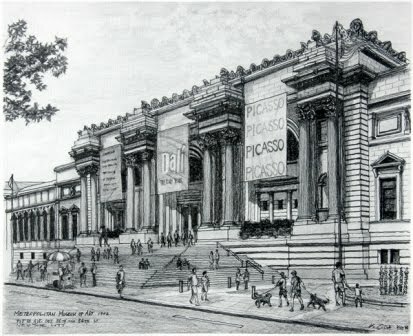 This eventually developed into drawing New York City architectural buildings with pen and pencil. He began studying watercolor ten years ago and has concentrated on this medium since then. For him, watercolor is a fluid medium and quickly evokes a spontaneous and natural mood. He has always been attracted to the City’s timeless images. Recently he has incorporated people into his paintings to enhance the true feeling and rhythm of the City. He is equally fond of the New England country sceneries of all seasons. He enjoys capturing the wind by the seashore and the spirit of an old barn that express the intimacy of quiet moments. Kaz now lives in Bridgeport, Connecticut. His work has been exhibited in Tokyo and regularly in various local shows in Connecticut.